The Enchanting Rainforest Hideaway is a custom vacation home which stands alone on 2 private acres surrounded by a lush rainforest which gives you the experience of old Hawaiian style simple elegance. Beautiful custom vacation home on 2 private acres in a rainforest setting all for yourself with no one else around. The house is romantic, peaceful and clean. Perfect for honeymooners, personal retreat, Eco travelers, yogis, adventurers, or anyone who just wants to get away from it all, but still be close enough to all that the Big Island has to offer. We are centrally located in Puna, 15 miles south of Hilo, 5 miles outside of the quaint town of Pahoa with all its restaurants and shops. Spend your days exploring the near by warm ponds, black sand beach, snorkeling, hiking, restaurants, waterfalls, Volcanoes National Park, current lava flows, Mauna Kea summit, museums, and much more. You can relax on the over sized bamboo furniture in the large screened-in living room and hear the songs of the rainforests' birds and frogs as you look out onto the lush jungle landscape.. The bedroom has a comfortable queen size Sealy posture pedic mattress. High thread count organic linens are provided for your comfort. Hand crafted, custom double doors lead out onto the lanai. The kitchen has a full size refrigerator, stove/oven, custom cabinets and tiles, pots, pans, toaster, coffee maker, blender, plates, glasses, bowls, cutlery, coffee and coffee grinder, tea, condiments and spices. Sliding glass doors lead out onto the lanai. There's a phone, internet, washer/dryer, outdoor shower, BBQ, boogie board, snorkel gear, tent, guidebooks and other thoughtfully provided special touches to make your stay very comfortable and relaxing. The art nouveau inspired bathroom features an antique clawfoot bathtub and a pedestal sink. Fluffy towels and bubbles are provided. Drive onto the property and experience the enchanting elegance of the lush Hawaiian garden filled with exotic tropical plants, flowers, palms and bamboo. Very private, this your own personal piece of old style Hawaiian paradise. There is a small orchard and guests are welcome to enjoy the harvest when in season. This house inspires relaxation, come join us for the vacation you deserve. 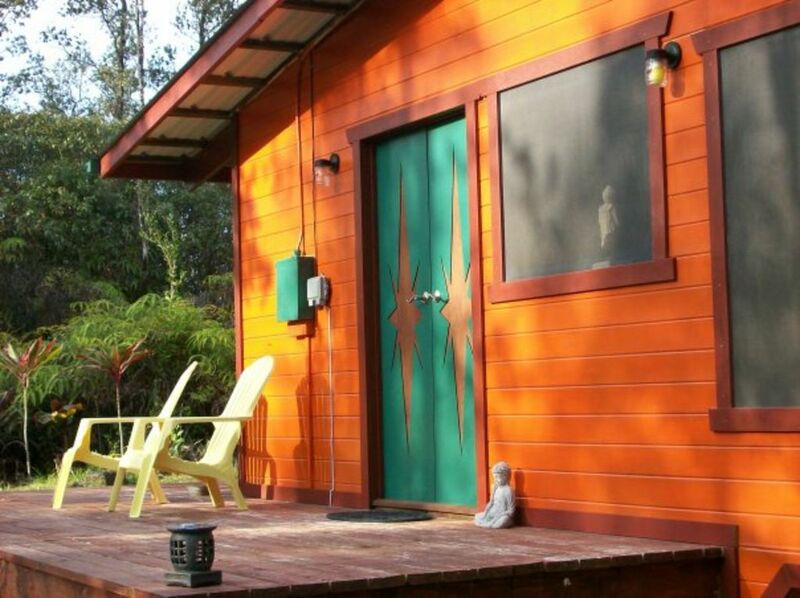 Watch the Enchanting Rainforest Hideaway on "Tiny House Hunting" FYI channel, season 2, episode 17, currently streaming. Follow/ Like us on FB ~ Enchanting Rainforest Hideaway for more photos and updates about Hawaii Island. Fun loving couple, semi retired from the entertainment business, now living in the jungles of east Hawaii. World travelers, we spend most our days organic farming and building our rammed earth house. We live up the road from the Rainforest Hideaway on a separate property. Our friendly and well behaved dogs, Jackson and Frankie, often join us to greet our guests upon arrival. Andrew, originally from Australia, designs and builds custom homes and is a FEO Officer and tanker driver for the local Volunteer Fire Department. Connie is a wardrobe stylist and yoga instructor at her own yoga studio in Pahoa. The Enchanting Rainforest Hideaway is a unique and very private property. Located in a rare old growth jungle/rainforest area of Puna with many native and exotic plants and trees, yet still just a mile from the highway, 200 ft. off a paved road. (unpaved road is maintained and fine for rental cars) The perfect location to get away from it all but still be close enough to all the sights, restaurants and activites. Many other places you share the house or property with others, but not here. This is 2 acres all to yourself, beautifully landscaped with many extra touches to make your stay more relaxing and enjoyable. Enchanting Rainforest Hideaway has been awarded 2014, 15,16, 17 Certificate of Excellence and Super host status for consistently earning top ratings from our guests. Follow/ 'like' us on Facebook ~ Enchanting Rainforest Hideaway Hawaii Island, aka the Big Island, was ranked number 7 as the World's Best Island destinations in Travel and Leisure magazine, Winter 2015. Come explore one of the planets' most beautiful islands for yourself. 2 acres of dense jungle/ rainforest in an untouched, natural setting. There are many farms in the area. All surrounding properties are at least 2 acres. Screened in living room, oversized bamboo furniture for lounging as you enjoy the sight and listen to the songs of the jungle. Large lawn area outside of the house with many exotic tropical plantings in the garden. There is a small orchard toward the front of the property and guests are welcome to the fruit when in season. We are located close to Volcanoes National Park and Kalapana where the active lava flows down the volcano and meets the ocean. This is one of the world's most active volcanoes and viewing is quite easy and accessable. The park is other worldly and the flows are fantastic. You can view by helicopter, boat, car or my favorite, on foot. Local guides available and recommended. Not to be missed, a real bucket list experience.